At Bowdoin College, the call to sustainable arms comes from students, alumni, faculty and staff: if you are building, it better be green. “We hear it from all corners of campus,” said Matthew Orlando, the college’s chief financial and administrative officer. 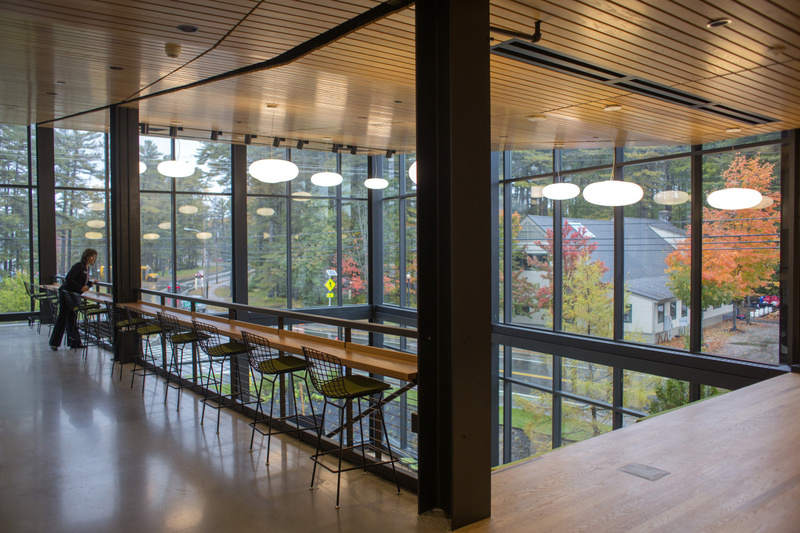 The newly opened Roux Center is part of Bowdoin’s commitment to a zero net impact on carbon emissions. Orlando leads Bowdoin’s Treasurer’s Office, which makes him the person in charge of the college’s considerable purse strings, and he has been listening. Last week in Brunswick, the college officially opened the latest addition to a campus that began with one simple brick building in 1794. On the eastern edge of the campus stands the Roux Center for the Environment, funded in large part by a $10 million gift from David and Barbara Roux, built to meet LEED platinum standards. (LEED stands for Leadership in Energy and Environmental Design.) How good is platinum? It’s the highest standard given out by the U.S. Green Building Council. It’s also better even than the uber-green hockey rink at the college’s southern edge. Meanwhile, on the western edge of the campus, work has already begun on Bowdoin’s next building project, four apartment-style dormitories built to passive house standards, meaning they have such a tight thermal envelope that they will literally heat and cool themselves. These are the kind of projects made easier by having an enormous endowment – Bowdoin’s was $1.455 billion in 2017, and it was ranked 69th in the nation on the Chronicle of Higher Education’s list of academic institutions with endowments over $500 million – but necessitated by a code passionately upheld by an academic community with a clear-eyed vision of a future shaped by climate change. A move away from fossil fuels is both a moral imperative and a survival instinct. Maine academic institutions have led and continue to lead the charge nationally. Unity College in Unity was the first college in the nation to open a passive house residence hall. Colby College, another school with a whopping endowment, albeit half the size of Bowdoin’s ($775 million), ranks second for “air and climate” on the Association for the Advancement of Sustainability in Higher Education’s 2017 rankings for green schools across the nation. Bates College in Lewiston is ranked fourth on the same association’s list for energy use last year. Its two newest dorms, opened in August 2016, are “very green,” according to Tom Twist, the school’s director of sustainability. Keisha Payson, Bowdoin’s director of sustainability, pointed out that Bowdoin met its 2020 goal of carbon neutrality earlier this year, ahead of its own timeline. 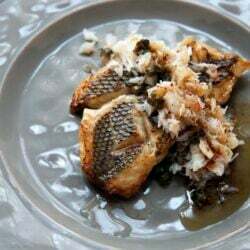 (It joined Colby and College of the Atlantic in Bar Harbor in doing so.) That means its net impact on carbon emissions – the leading cause of climate change – is now zero. But beating the deadline didn’t mean that the college was done, Payson said, not by any means. Building the Roux Center and then moving on to put in passive house dorms was a natural fit with that overarching philosophy. Kalperis Hall is one of two dormitories at Bates College in Lewiston that help the school meet environmental and energy-efficiency goals. “I look at it as the win-win-win,” Payson said. “The sustainability office is going to see reduced energy usage. It’s a win for the Treasurer’s Office because the long-term bills in terms of paying for utilities will be smaller. And it’s a win for students because in a passive house, the thermal envelope is going to be very comfortable.” Not too hot, not too cold? Yes, Payson says, the opposite of the older buildings, where the third floor grows hot in winter while the ground floor stays cold. It’s not just a win for the occupants, but for the environment as a whole. But even with the word “win” out there, sustainability directors don’t see it as a competition. “It doesn’t really feel like as much of a competition as you might think,” said Tom Twist, Bates’ director of sustainability. He and Payson are members of the Green Campus Consortium of Maine, which meets regularly for brainstorming sessions. Case in point, Bates’ energy manager was headed to Brunswick for a tour of the Roux Center last week. And the sharing extends outside the state as well: Twist is expecting a visit from the staff at the University of Massachusetts Amherst, which he said is considering using renewable fuel oil and wants to check out Bates. “We all meet and share ideas,” Twist said. They leave the one-upping each other to the sports teams. “Athletics is a different story,” he added. Beyond its new dorms, Bates is the first – and only – academic institution to convert its heating system to a wood-based fuel. Bates had considered going the way of Colby, which earns its high sustainability ratings nationally in part because it installed a biomass heating plant in 2012. (Making a commitment to purchasing electricity only from green sources in 2003 also helped the college meet green standards.) That plant uses locally sourced wood chips (from within 50 miles from Waterville) to heat the campus. But for Bates, the price tag was too much, and the physical footprint it required was a challenge in densely packed downtown Lewiston. Instead, Twist said, the college decided to shift to a new product called renewable fuel oil, pioneered in Canada and derived through a process of heating (sustainably harvested) low-grade wood products, including sawdust. “It’s heated but in the absence of oxygen, so it can’t combust,” Twist said. “The volatiles from it, which look like smoke, contain a lot of energy. 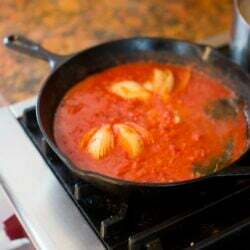 You recondense it and it forms a liquid.” The process is called pyrolysis. And yes, the smell coming from the boiler does have a hint of barbecue. Bates is the only academic institution in the United States that uses renewable fuel oil – which they source from a Quebec company called Ensyn – and this January will complete a transition to using it exclusively. Right now, it fills about 70 percent of the campus’ heating needs, and the conversion, Twist said, was about a tenth the price of the proposal for a biomass plant. 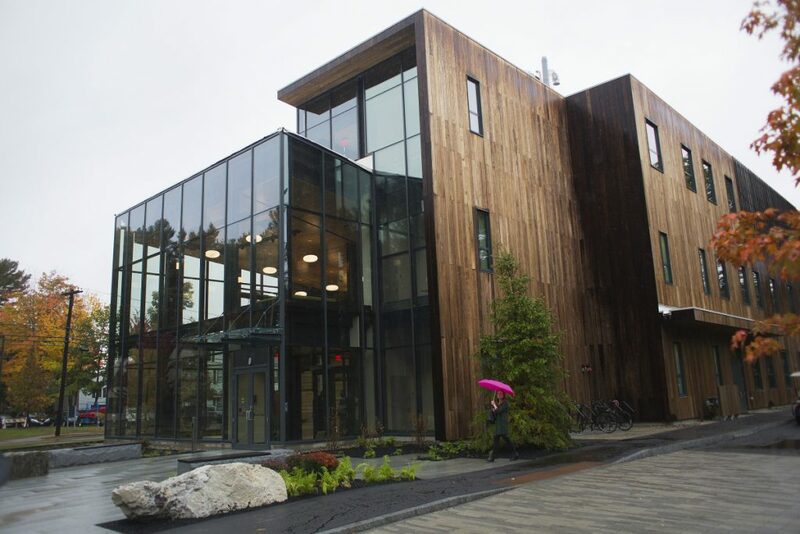 Bowdoin College’s new Roux Center for the Environment includes a living roof, solar energy and a water cistern designed to recycle and use water to maximum efficiencies. The outside of the building is sheathed in poplar, sustainably harvested in Virginia. Even if this isn’t a competition, there is an equation, a calculus both financial and emotional. Orlando points out that Bowdoin spent “several hundred thousands of dollars to get to LEED platinum” at the Roux Center. That included installing a living roof, solar and a water cistern designed to recycle and use water to maximum efficiencies. The outside of the building is sheathed in poplar, sustainably harvested in Virginia and heat-treated to be durable. 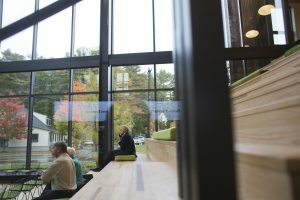 Although it is poplar, the Roux Center’s lead architect, Timothy Mansfield of CambridgeSeven, said it is intended as an homage to the bark of the Bowdoin pines that surround the eastern side of the campus. 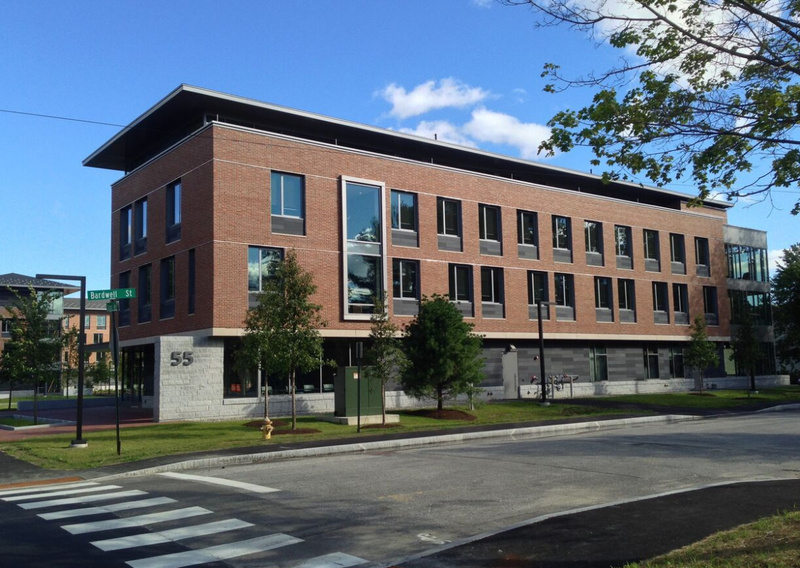 Mansfield said this is the eighth project CambridgeSeven has completed for Bowdoin, including renovating the former Longfellow Elementary School into the Edwards Art Center in 2013. The college is very much part of a national trend. In the simple equation of balancing the books, going green may cost more upfront. “Fossil fuel sources are so cheap right now,” Orlando said. Assume, he said, that the college spent $3 a square foot on standard utilities for the 29,000-square foot building. Going green would cut those utilities costs in half. But balanced against those several hundred thousands of dollars? It’s not cheaper out of the gate. 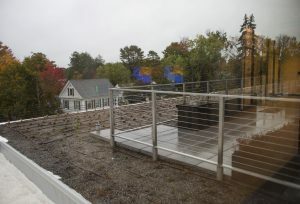 The rooftop garden on the third floor of the Roux Center for the Environment at Bowdoin. Professor Matt Klingle heads the Environmental Studies program at Bowdoin, one of two departments now housed in the Roux Center after being based in different – and separate – buildings. He served on the building committee for the new center. And he’s an enthusiast, although perhaps less for reasons of carbon neutrality and solar geegaws than for the shifting academic infrastructure that it supports, whereby multiple disciplines, including literature, history and art, can come together as one to face a changing future. Climate change, Klingle says, is the 1,000-pound gorilla in today’s world. “It is planetary and systematic and deeply rooted in the ways we conduct our everyday life,” he said. Solving it is not going to be the job of just scientists. It’s going to take a wide view from many kinds of disciplines, he said. And people. “The building now gives us a place where we can really try to make these connections across campus,” Klingle said. He also wants to use the building as a practical example students can learn from, of the face-off between a carbon-free future and a practical now. “I want students to think critically about it,” he said. And other “green” buildings and objects. Electric cars are great, except for the part where they haul around 300-pound batteries, he said. “Simple physics.” Environmentalism must face off against very real financial constraints, he said. For junior Kitrea Takata-Glushkoff, Bowdoin’s stance on sustainability was part of the attraction. A resident of the Bay Area, who considers Berkeley, California, her true home, she visited 24 schools before choosing Bowdoin. She worked for the office of sustainability as a freshman and sophomore, serving as an EcoRep to boost awareness of sustainability among her peers. And she’s majoring in Earth and Oceanographic Science, the other department that moved into the Roux Center. She’s not in love with the new building entirely – she worries about light pollution from the wall of windows at either end for one thing, and the exposed pipes meant to show off the inner workings of the building make at least one classroom noisy – but her hope is that having such a public face for the environment will help draw in classmates who are less interested in the topic. It, like the passive house dorms due to open next August, right in time for her senior year, serves as a physical embodiment of an ideal, and a movement. The lottery for those opens in April, and Takata-Glushkoff will be putting the passive house dorms on her wish list. “I feel like everyone is going to list that as their first option,” Takata-Glushkoff said.